Alsike Clover (Trifolium Hybridum) - Alsike clover is a short-lived perennial plant, alsike clover lacks persistence so is treated agriculturally as a biennial. 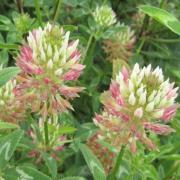 It is grown widely in the eastern and northern mid-western states, and in the Pacific Northwest from bulk clover seeds. 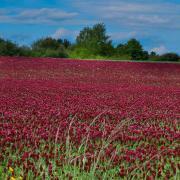 Similar in many ways to red clover, it matures a week to ten days earlier. Arrowleaf Clover Zulu (Trifolium Vesiculosum) - This legume can be used for grazing, hay, haylage, or greenchop, but it is most commonly grown for grazing. A good clover stand often produces 1 1/2 to over 2 tons of dry forage per acre, which is equal to or better than other annual clovers commonly grown in the United States. 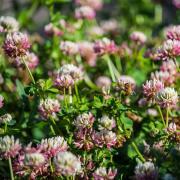 Arrowleaf clover can grow up to four feet tall if not grazed. 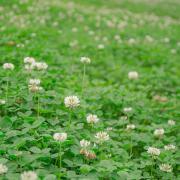 Clover King is the ideal perennial blend for deer food plots. Makes a great seed mixture as it is 90% clover with 10% alfalfa for extra flavor and palatability. This mixture of clover and alfalfa will provide approximately 30% protein for the majority of the year for increased antler growth. A single planting can last up to 5 years without re-seeding. 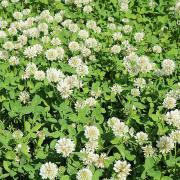 Ladino Clover (Trifolium Repens Latum) - Ladino clover is a large white perennial bulk clover which makes up about half the total white clover acreage in the U.S. Its high nutritive value and palatability make it a popular choice in pasture mixtures. It is not deep rooted, and will not tolerate much drought. It is two to four times as large as common white clover. Lespedeza (Lespedeza Capitata) - Start Lespedeza seeds for a naturalized landscape setting. 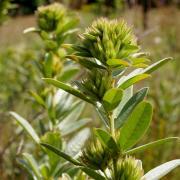 Also known as Round-headed Bush Clover, this beneficial flowering plant grows best in full sun and dry conditions. Lespedeza is adaptable to different kinds of soil that contain significant amounts of loam, clay, sand, or rocky material. Miniclover® has one of the smallest leaf blades of any clover and only grows approximately 4 inches tall. This is the best perennial clover to use when adding a clover to a lawn to help fixate nitrogen and keep the lawn healthy. 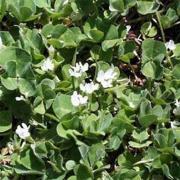 It is not aggressive like White Dutch Clover and the leaf blade is approximately 1/2 of the size. Best clover seed for lawns. Prairie Clover (Dalea Purpurea Purple) - Prairie Clover seeds are perfect for a meadow, naturalized setting, slopes, or along road sides. The Dalea Purpurea plant prefers a full sun setting and well-drained soil. Purple Prairie Clover is a unique perennial that features lavender-purple flowers on slender spikes, and bees absolutely love the clover blooms. 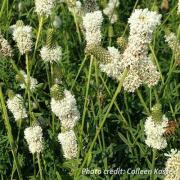 Prairie Clover (Dalea Candida White) - Start Prairie Clover seeds for an attractive, versatile, native perennial. Prairie Clover plants have pale green foliage with leaves that can vary from 2 - 7 inches in length. Sprouting from this foliage are short spikes of white flowers which are 1 - 3 inches in height and approximately 3/4 inch in diameter. 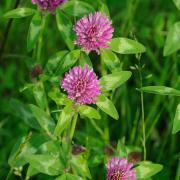 Red Clover (Trifolium Pratense) - Red clover is the most widely adapted of the true clovers. 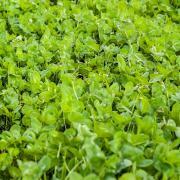 These short-lived perennial clover seeds are grown in Canada and most of the U.S. except the Great Plains states and the southwest. Mixes well with grass, used for hay, pasture, and soil improvement. Strawberry Clover Palestine (Trifolium Fragiferum) - Strawberry clover is a perennial clover similar to white dutch clover in growth habit. Spreads by above ground stolons, similar to strawberries. Adapted to wet saline and alkaline soils and can tolerate a wide range of soils. Will tolerate flooding. 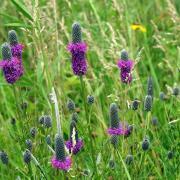 It is principally a pasture plant that is somewhat drought resistant. 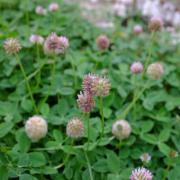 Strawberry clover develops a good sod, and is very palatable. Super Haifa (Trifolium Repens) - Haifa white clover is a perennial, highly palatable clover, often used in pasture mixtures west of the Cascade range. As a pasture plant, white clover yields are greatest in mild humid climates. Best adapted to well-drained silt loam and clay soils with a pH range from 6.0 to 7.0 in humid and irrigated areas. 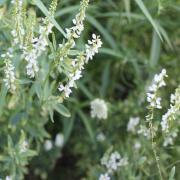 White Sweet Clover (Melilotus Alba) - Sweet clovers are widely used as erosion controls, ground cover, forage, and honey production. 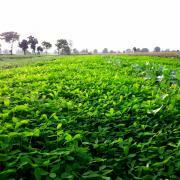 Clover is a legume and has nitrogen fixing capabilities, thereby improving soils for other crops. The plant is a biennial and was introduced to the United States in the 1700s. 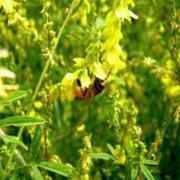 Yellow Sweet Clover (Melilotus Officinalis) - Biennial sweet clover thrives under a wide range of soil and climatic conditions. However, it will not tolerate acid soils. 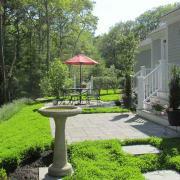 It is drought resistant, winter-hardy and productive throughout all 50 states. 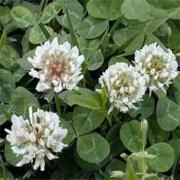 White Dutch Clover (Trifolium Repens) - White Dutch Clover designates a strain of white clover which is perennial. 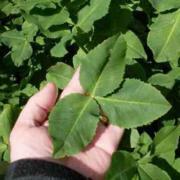 Used in lawns, as a ground cover, cover crop, for erosion control, and in pasture mixtures. Popular clover seed for lawns; however, Miniclover® is a better lawn alternative.